You may know the story of Tyndale, a man consumed by the goal to translate the Bible so every English plough boy could read it, a man hunted as a heretic and eventually martyred for his work. Tyndale by David Teems does not focus on this story, but rather tells the tale of his work, his world, and his influence on the English language. 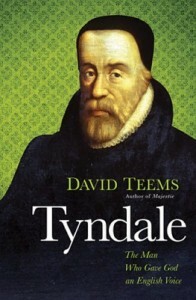 With extensive research and numerous excerpts from the writings of Tyndale and others, Teems shows how Tyndale was shaped by the Word, not by the violent and crude world around him. He shows how Tyndale’s translation of the Bible, echoed in the King James Version, formed the basis of modern English, deeply influencing Shakespeare and all who followed. And he explains Tyndale’s beliefs, expressed in his books as well as in his Bible notes. This is a brilliant book, illuminating the Reformation era as much as Tyndale’s life. I expected to learn about Tyndale when I picked up this book. I also learned about the English language, Sir Thomas More, everyday assumptions of the day, and serving God—the quotes from Tyndale abound with insight on serving God. Teems is unlike his subject, though. His language is high flown and occasionally bombastic. His assumptions and comments show a man who seems, to me, to stand aside from rather than beside Tyndale. If you are looking for a story about Tyndale, you will need to look elsewhere. If, however, you’re looking for a careful analysis of his work, personality, language use, and times, this book will be a joy, except where the author intrudes. Recommended for older teens and adults. This is my 20th book in the in the 2012 52 Books in 52 Weeks Challenge, and is also linked to Saturday Reviews.